TNT Fireworks Superstore in Dania Beach was open around the clock to handle the Fourth of July holiday rush. The TNT Fireworks Superstore in Dania Beach has been open around the clock since July 2nd to handle the Fourth of July holiday rush. Marketing manager Itzhak Dickstein says the company hired an extra 200 employees to manage the steep increase in customers. 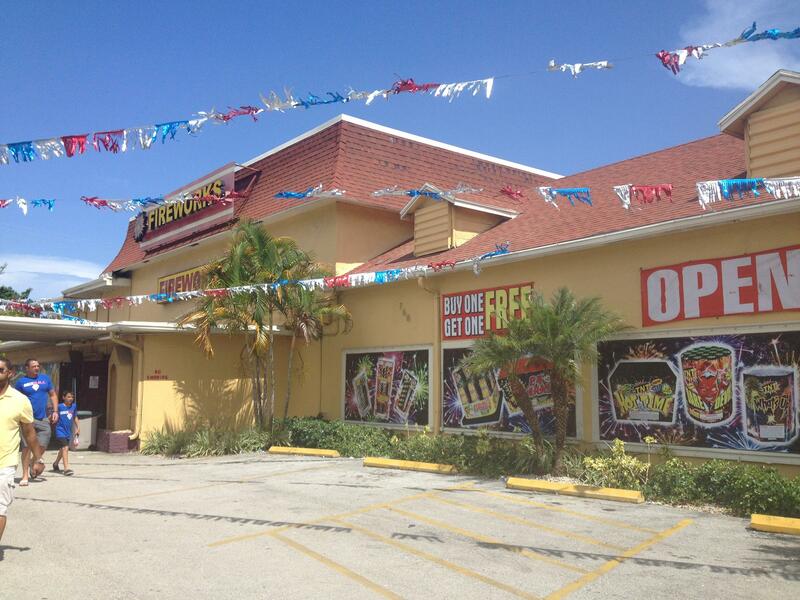 To buy fireworks, customers first have to navigate police-directed traffic and find parking among the businesses near the Broward County fireworks store. The first stop is a white tent in the parking lot next to the 18,000 square foot space. There, customers provide identification and sign a waiver indicating that they will only use the fireworks for legal purposes. Technically, fireworks are intended for controlling pests, like birds, under state law. It is on the customers to make sure they are following the laws of their community, according to Dickstein. Customers then enter a building filled with fireworks -- many buy one get one free. There are television screens which show customers how the fireworks look when lit. Dickstein says the most popular firework for the Fourth of July is called "Corruption." It's buy one get one free, for $239.99. After the store closes at midnight, Dickstein says the year-round staff-- 12 in total-- will take a break. Then they take inventory. Any items in surplus will be put on a special sale, and the rest will be kept for the next big fireworks holiday: New Year's. Jennifer Bruner spent her 4th of July much like the rest of us: celebrating with friends at a backyard barbecue. Little did she know how her life would change in a matter of seconds on that fateful evening. "I went over to a friend's house for a barbecue on the 4th of July," Bruner recalls, "And my friends were out on the pier lighting fireworks. One firework tipped over when it was lit and it was supposed to shoot up, but it went sideways shooting at me and this little girl." 07/02/14 - On Wednesday’s Topical Currents we’ll sit for a spell with Mitchell Kaplan, founder of Books & Books and co-founder of the Miami Book Fair International. He’ll tell us how he has become one of the country’s most successful independent booksellers and about his plans to venture into publishing. We’ll also get his recommendations for a good summer read. Join us and call in with your own suggestions on the next Topical Currents, Wednesday at 1pm. 07/25/13 - Syndicated food columnist Linda Gassenheimer, Special wine correspondent Fred Tasker and WLRN hosts Joseph Cooper and Bonnie Berman interview Rosa Mexicano Regional Executive Chef James Cawley. State pest control officials are renewing the war against a versatile and destructive termite they thought they had defeated a decade ago. But the tree termites -- mobile, airborne, prolific and voracious -- have gained a new foothold in Broward County. Experts who met Wednesday to develop a termite strategy say the insects have overrun a square mile of Dania Beach.